On Tuesday, Kathie and I collected quite a bit of zig-zag goldenrod (Solidago flexicaulis), an interesting woodland/savanna species. 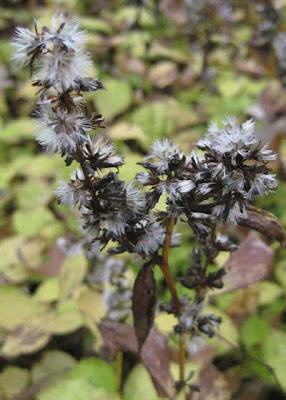 This is one of the latest blooming species of goldenrod, and its seeds are just now ready to collect. Strange that it is also one of the earliest goldenrods to appear in the spring. It remains a low, vegetative plant all summer and does not begin to flower until late August/early September. Although the leaves of most plant species turn brown at the time they are setting seed, the leaves of zig-zag goldenrod remain quite green. This makes it easy to spot a patch in the woods. In contrast to most goldenrods, the flowers of zig-zag goldenrod are formed in the axils of the leaves, where they remain relatively inconspicuous. 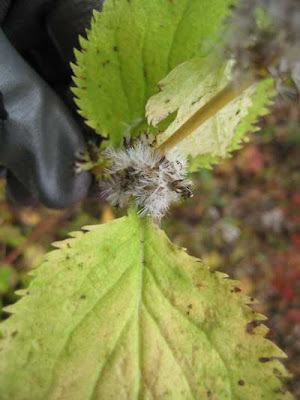 Of course, the seeds also form in the axils of the leaves, making collecting them a bit of a challenge. You can hand-strip the seeds off the stems, or you can cut the top parts of the plants and strip them later. Either way, you end up with quite a few green leaves mixed in with the seeds. The leaves complicate the drying process, and it is best to pluck off the leaves before laying the collection out to dry. 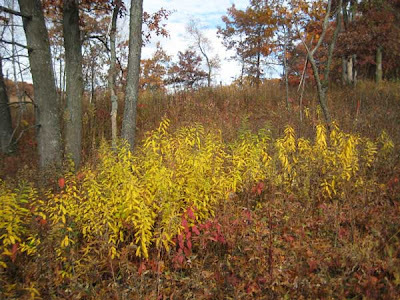 According to Curtis (Vegetation of Wisconsin), zig-zag goldenrod is modal (most frequent) in southern mesic forests. He doesn't mention its presence in oak openings, although at Pleasant Valley Conservancy it has done quite well in the shadier parts of our savannas. Kathie and I spent the day collecting seeds. Lots of species were now ready and we had a great time. Each of us had two buckets around our necks in addition to lots of paper bags (both large and small). 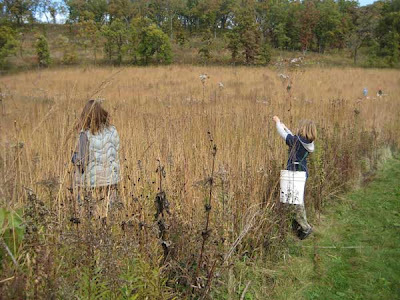 We found the Ridge Prairie to be a really great seed collecting site. We have somewhat neglected this small four-year old prairie, and were pleased to see that it had lots of plants with seeds ready to collect. Among others, we collected New England aster, gray goldenrod, sky blue aster, mountain mint, wild quinine, elm-leaved goldenrod, zig zag goldenrod, showy goldenrod, and false foxglove. Mountain mint (Pycanthemum virginianum) and wild quinine make an interesting pair. Mountain mint is often thought of as a wetland species, and we do have quite a bit in our wetland, but the Ridge Prairie has lots more. This is a bit strange, since the Ridge Prairie is a dry mesic site, not exactly what one might expect as a good place for mountain mint. However, Cochrane and Iltis do mention that this species is occasionally found in dry prairies and oak-pine woods. No one has mentioned why this species has the common name "mountain", since its habitats are anything but mountains. Wild quinine (Parthenium integrifolium), on the other hand, is supposed to be restricted to mesic and wet mesic prairie habitats. So what is it doing in a dry prairie? Actually, it has done fairly well in the Ridge Prairie, and we found it flowering in the second growing season. 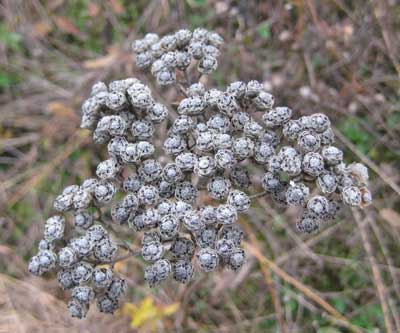 In contrast to mountain mint, wild quinine is fairly uncommon in Wisconsin and is on the State Threatened list. 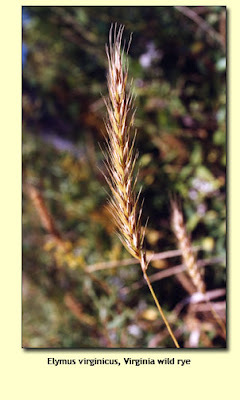 When collecting these two species, one has to pay attention, because their seed heads are fairly similar (see photos). Both have gray-colored flat-topped seed heads. Considering that their habitats are so different, it is interesting that they are found growing side by side in the Ridge Prairie. We continue our work getting the East Basin ready for late fall planting. The trees from the large grove of aspen that were killed by girdling were cut in early September and stacked in large piles. Yesterday we started these piles on fire, using drip torch fuel as an accelerant. We had a large crew: 4 people from the contractor Michler and Brown, 5 of our own people, plus Michael Vahldieck as a very welcome volunteer! Michler/Brown people did mostly chain saw work, recutting stumps, cutting some remaining logs, and helping start and tend the burn piles. Once these piles were burning we spent the rest of the day picking up all the loose wood lying around and throwing it on the piles. The goal was to get as much wood as possible off the ground so that planted seeds will find good homes to grow in. Aspen is often called "gopher wood", because it burns up so fast that you must keep going back for more. True to form, by the end of the day, the piles had really shrunk, and by this morning they were down to smoldering coals. 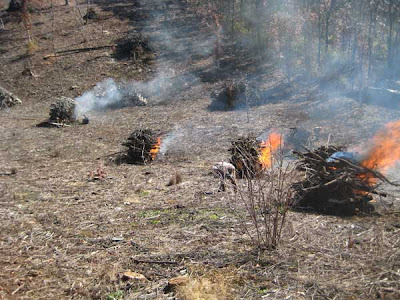 Paul Michler and Amanda spent the morning consolidating the piles, moving partially unburned wood into the coals. Once the piles have cooled down, we will return with a leaf blower and get rid of the ash so that bare soil is exposed. When we plant the prairie, we will make sure that each burn scar is well planted. Yesterday was peak fall color at Pleasant Valley Conservancy. It was also a brilliant, sunny day, starting out a bit cool but later warming up enough for shirt sleeves. We spent the day seed collecting and doing odds and ends of chores. I was struck by how certain species really stand out because of their fall colors. Two species in particular were noteworthy, prairie willow and white wild indigo. Prairie willow (Salix humilis) is one of the few native willows that is common on dry upland sites. We originally had just a few small patches in one of our small prairie remnants, but it is gradually spreading to other of our upland sites. 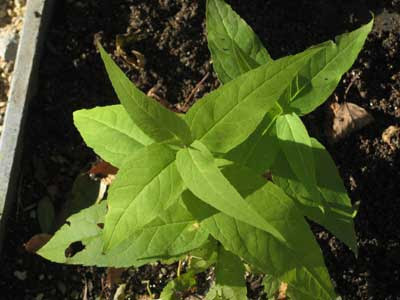 It is easy to spot early in the spring when it is in flower, but then it disappears into the greenery until late fall, when its leaves turn color. The photo here is of a small clone that has moved into a restored site adjacent to one of our original remnants. It really stands out now because of its color. Clonal species such as this must be kept under control so that they do not take over a natural area. So far, prairie willow is quite rare at Pleasant Valley Conservancy, but we plan to watch it to be sure it does not start to dominate. 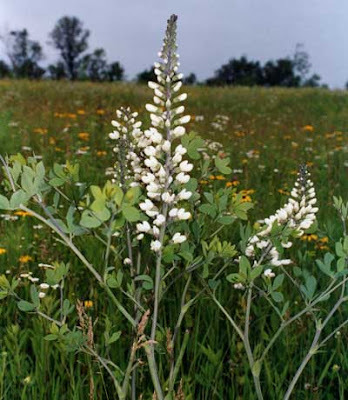 White wild indigo (Baptisia alba) is quite widely planted in prairie restorations because of its striking appearance, especially when flowering. However, due to habitat destruction, it is much less common outside of planted prairies than formerly. At Pleasant Valley Conservancy we had a single fairly large native patch at the edge of what is now Toby's Prairie, but it has been in the seed mix for all of our planted prairies, and has become well established in every one of them. It has also become established in smaller amounts in our savannas. During the summer, when everything is green, Baptisia does not stand out, but it retains its green color longer in the fall, and is easy to spot right now, as the photo of the Ridge Prairie shows. 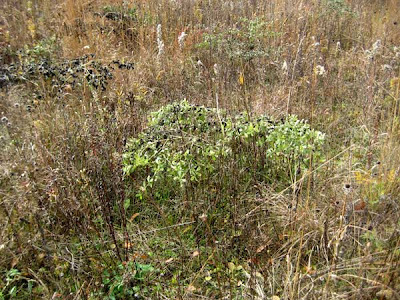 This photo also shows several Baptisia plants at a later stage, when their leaves have turned coal black. The photo below shows what Baptisia looks like during its spectacular flowering stage. 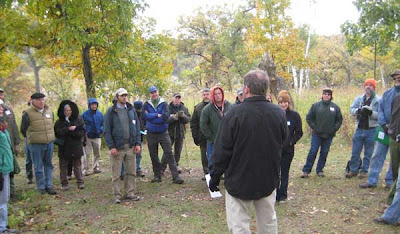 In the winter of 2008-2009 we did an extensive survey of all of the trees greater than 10" diameter in the savanna/prairie areas. Most of the survey was done by Heisley Lewison during the heavy snow period when we could not work on brush control. Each tree was marked with a permanent numbered marker, its species and diameter recorded, and its position marked with a Garmin GPS. The data were uploaded to my computer and converted to an ESRI shape file. I have been using this database all year for a wide variety of purposes. Most of the details will be reported later, once we finish marking the trees on the north slope. At present, most of the marked trees are either on the south slope or ridge top. A total of 2223 trees have been marked and now exist in an Excel database. There are, of course, other species present in much smaller amounts. 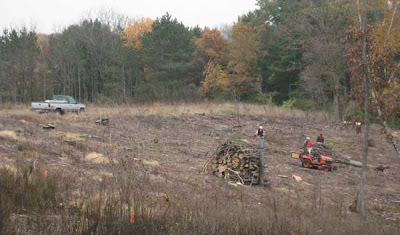 Most of the other species have been removed, although there are a few left of walnut, butternut, yellowbud hickory, cherry, red maple, and basswood. And lots more trees from the above list that are under 10" in diameter. 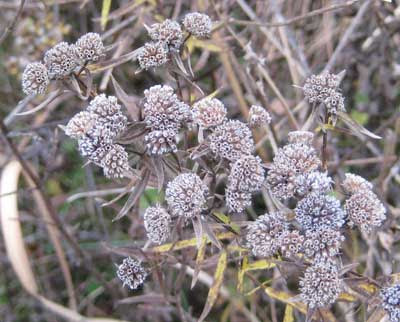 Upland boneset (Eupatorium sessilifolium) is a species listed as Special Concern in Wisconsin. It is a savanna specialist that is found mainly in open shade. It is found only in a few counties in southern Wisconsin. It has the very high C value of 9. Strangely, it is not listed in the Cochrane/Iltis Atlas of Prairie and Savanna Plants, although it is in the well-known list of savanna indicator species of Brian Pruka. We have a small native population of this species, and have been raising plants for transplant into other parts of the Conservancy. Unfortunately, seed germination efficiency has been low, so we have had difficulty getting a lot of plants for transplant. As a final effort to get plants, in early May Kathie sowed a good layer of seeds in soil and put the flat alongside our driveway at home. We kept the flat watered all summer and were pleased to have a large number of seedlings developing. By the end of summer, the flat was full of plants (about 30). 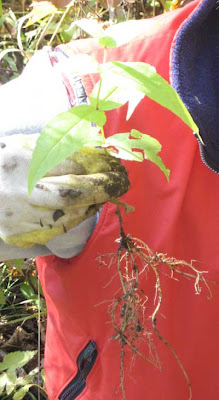 As the photo to the left shows, the root structure was well developed. Since fall is a good time to transplant native species, we used a hiatus in our seed collecting work to get these plants in the ground. Mice are a permanent part of any rural setting, and can often do wondrous things. This fall we have had a couple of surprises which show something about their abilities. Who knew what these tiny creatures could do? 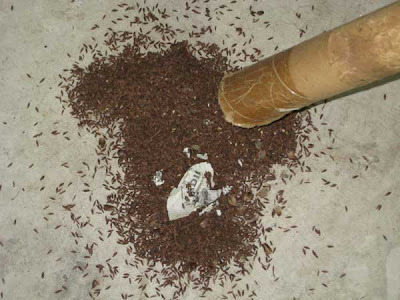 The first photo shows a stash of Gaura seeds which mice made inside a long mailing tube. This tube got left inadvertently on the ground. The Gaura seeds were drying on the barn floor about 30 feet away. The mice were very selective, as at least a dozen different species were drying there, and the mice picked only Gaura. These seeds had been stuffed somewhere up into the tube, and when it was picked up they came pouring out. What a lot of mouse work! The second photo is even more strange. A work glove got left on the table in our cabin/shack. Somewhere nearby the mice found a small supply of tick trefoil seeds. 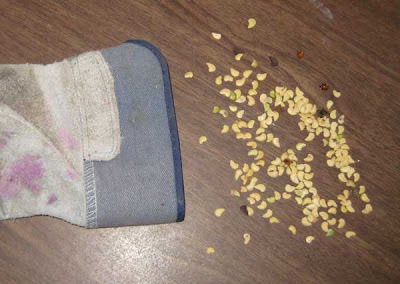 They not only moved these seeds into the glove, but they shelled them. A few unshelled seeds can be seen lying about, but most of the seeds are hull-free. Even a hammer mill won't get seeds this clean! Since I am so heavily involved in oak savanna restoration, I am always on the lookout for sites that are potentially restorable. The best such sites are those with large open-grown oaks. Most sites of this sort are now heavily degraded, but one can often see the "good" oaks somewhat hidden among the invasive brush or trees. After we cleared the East Basin (see other post), I was able to look into my neighbor's land for the first time and saw several quite nice open-grown bur oaks, surrounded by honeysuckle and other invasive brush and trees. In the forestry literature, such lone trees are sometimes called "wolf trees" and are evidence of an earlier more open forest situation. I'm not surprised that my neighbors have a potential savanna, since their property is similar to ours in climate, topography, soils, and exposure. 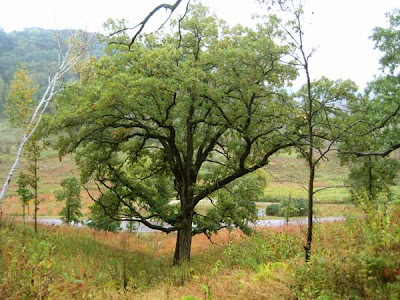 Indeed, there are many potential oak savannas in the Driftless Region of southwestern Wisconsin. Once you know what to look for, you see them everywhere. This time of year is especially favorable for spotting bur oak savannas, as the leaves have changed color and stand out, especially when blowing in the wind (the underside of a bur oak leaf is light in color). Indeed, almost every ridge top in southwestern Wisconsin has a restorable savanna! The area we call the East Basin is the last remaining part of Pleasant Valley Conservancy to be restored. It is a 5-acre hill site at the far east end of the property, and we because it was really out of view down a hill, we chose to ignore it. When we finally started to restore it, back in 2006, we did not know exactly what problems we were going to have. Historically, the 1937 air photo shows that this site was completely open, and was probably prairie. Because it was far from the barn, and surrounded by land of other owners, it would have been difficult to pasture. Since it faces south and southwest, it gets good sun and because it is hilly, it is well drained. Except for a gully in the middle, we think it was probably dry mesic habitat. Through the years of neglect, this basin gradually filled in with shrubs and trees. There were even two small garlic mustard patches, the only significant infestations of this difficult plant on the property. There was also a major aspen clone, with close to 100 trees. 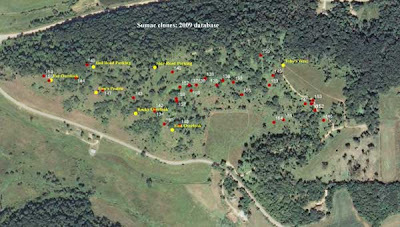 Most of the tree and brush removal was done in the winter of 2007. In May 2008 the aspen clone was girdled. 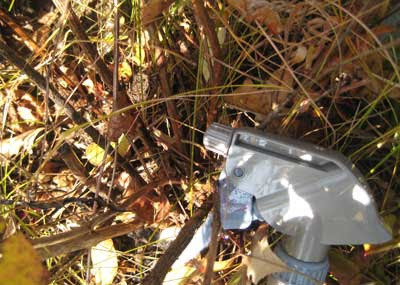 In summer and fall of 2008 resprouts of shrubs were sprayed with glyphosate. 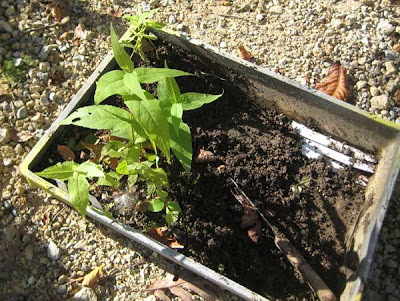 Canada goldenrod and mullein were also treated with herbicide. Since there was nothing "good", we did not have to worry about peripheral damage during spraying. In summer 2009, the site was sprayed twice with glyphosate, using a pump rig with a 300 foot hose. The herbicide treatment was very effective. Starting in September of this year, the girdled aspens (now dead) were cut and stacked. We have been archiving seeds for planting in November. A lot of these seeds were collected last year and after cleaning and mixing have been stored. The seeds collected this year will also mostly be used here. So now our job is to get this site ready for planting. There is lots of wood on the ground that must be removed so that our seeds can find the bare soil. Yesterday afternoon we started cleaning up the site. Our goal was to figure out the best way to do this. We made good use of our Kawasaki Mule and pickup truck. 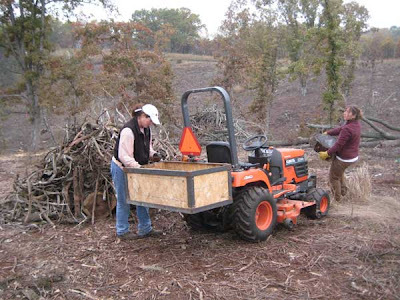 We also used our Kubota tractor, which has a custom "bucket" connected to the three-point hitch (see photo). While some of this "heavy" work was going on, I cruised the site with a portable herbicide sprayer containing glyphosate, spraying whatever perennials looked bad. There were quite a few patches of motherwort (Leonurus cardiaca), a persistent weed. Among other things, I spent some time looking at the soil and bedrock. Since I have a detailed bedrock map of Pleasant Valley Conservancy, I know that the rock in this area is Jordan sandstone, and that the soil is an eroded unit of Elkmound sandy loam. However, the Jordan sandstone in the East Basin seems to have a lot more iron than that elsewhere on the property, and the soil is quite red also. (The color actually shows in the lower photo.) It will be interesting to see how this prairie develops! We hope to have several volunteer work parties yet this fall. We need to burn all the brush and aspen piles, and will need quite a bit of help throwing woody debris on the piles (usually a fairly enjoyable activity). This is an excellent time to deal with isolated honeysuckles scattered across a natural area. 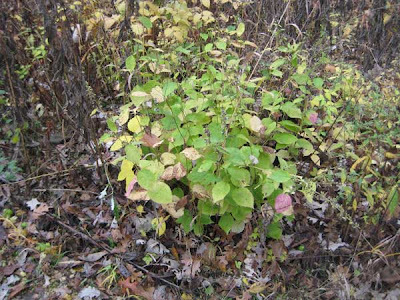 The native vegetation is now senescing and has turned color, whereas honeysuckle bushes retain their green leaves. As the photo above shows, honeysuckle bushes really stand out. In previous years, when we had quite a few honeysuckles remaining, we used a foliar spray with glyphosate. This worked really well. Honeysuckles are very sensitive to glyphosate, and since the native vegetation has senesced, it is unaffected. However, we have managed to reduce our honeysuckles to a quite small number, so it isn't really efficient to use this foliar spray. Instead, we are using a basal bark treatment with triclopyr (Garlon 4, in oil). I carry a spray bottle in a belt holster, and when I spot a small honeysuckle I treat it. For the basal bark, I just grab the stems and pull them back, uncovering the stem bases. A few spritzes of these bases is all it takes, as the photo shows. I am really pleased with how well we have been able to control honeysuckle. I spent some time Monday, when the weather was clear and sunny, looking at areas (such as Unit 21) that at one time had heavy infestations. I found a few small bushes, but they took very little time to deal with. Incidentally, Unit 21 was the area where I did my published research on honeysuckle control back in 2003. Here is a link to that paper. I wish buckthorn was as easy to deal with as honeysuckle! 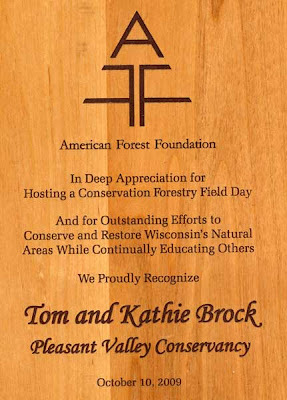 Here are the gritty details of how we did this: We made 5 foot wooden stakes out of 1 X 2 wood strips (furring strips) and used a Dremel vibrating marking tool to mark each stake with a unique number. The sumac clones are now showing their brilliant red fall colors and are hence easy to spot. We put a numbered stake at each clone and recorded its GPS coordinates. A few notes were made about the size of the clone, and the management unit it was in. Since this is the second year of our sumac control program, there were fewer clones (32 total; last year we had over 70). The Garmin data were uploaded to my computer and converted into an ESRI shape file which displays in ArcGIS. Each red dot on the air photo below is a single clone. Once our fall work is finished (seed collecting, burns, planting), through the winter, when weather conditions permit, we will be basal barking the sumac clones. Then we will return to each clone in June 2010 and again in late August to treat all the resprouts. Hopefully, that should eradicate the clones, but we will make sure by returning in the summer of 2011. The value of having permanent markers and the map is that we can be sure we don't miss any clones. The print out of the Excel file is used as a checklist. There is one more part of the sumac control routine. This is to basal bark any single sumac plants during the summer of 2010. These single plants represent the sumac clones of the future, so by killing them now we can keep them from getting established. We spent quite a bit of time this summer on these singles or small groups, and this work was successful. We don't need each such plant in the database, since the Garlon treatment kills the whole plant. I said above that we were not doing any cutting. This is because our clones are relatively small, fewer than 200 stems each. With very large clones, such as are often present in areas that have not been burned frequently, basal barking is fairly difficult because of the high stem density. In these cases, the best approach is to cut the whole clone with a brush cutter, carry away the mass of stems, and then treat each cut stem with Garlon 4 in oil, being certain that both the cut surface and the sides of the stem are treated (as in a basal bark). However, you still must return several times in the summer (and perhaps the following year) and treat the inevitable resprouts! Anyone interested in background on the biology of sumac might be interested in the summary I recently posted on my web site. 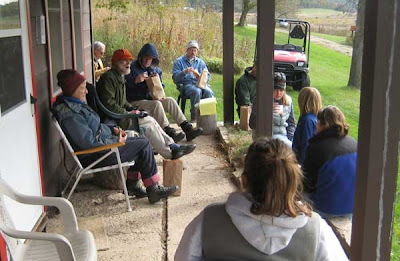 For the past few years we have been having an all-day seed collecting event in mid October. In the mornings we collect at Pleasant Valley Conservancy, have lunch at our cabin/shack, then go the few miles to Black Earth Rettenmund Prairie for the afternoon. This year, the weather cooperated and we had a very successful day (20 people participated, at either one or both sites). Species we collected at Pleasant Valley included: round-headed bush clover, Indian grass (lots), Missouri goldenrod, mountain mint, smooth aster, and pale Indian plantain. At Black Earth we collected (among others): purple prairie clover, rattlesnake master, naked sunflower, false and true solomon's seal, false boneset (Kuhnia), prairie thimbleweed, rose hips, Coreopsis, and stiff goldenrod. The weather has been a bit unsettled, but restoration must proceed any way. Yesterday, we collected virginia wild rye (Elymus virginicus) in a mild drizzle. This grass is found in mesic to wet mesic habitats and has a moderately high coefficient of conservatistm (6). At Pleasant Valley Conservancy a small native population developed in one of our restored savannas (Unit 18), and we collected seeds there and planted at other sites. When we planted the Crane Prairie in December 2005 we had enough seed to add this species to the mix. It developed well and is now fairly widely dispersed there among the much larger amounts of Indian grass. Most of our collecting was done there, although I did collect for a while at a savanna edge (Unit 20). Collecting it is fairly easy, even in wet weather. The seeds strip right off the stem, and the small amounts of moisture on the heads did not cause any problems. Within less than an hour, four of us had essentially a bucket full of seeds. Because the heads were wet, we spread them out on a couple of sleds and put them in front of a small gas space heater. Today, they are virtually dry. Because the seeds strip so well, we will not need to hammer mill them (which we have done with the other Elymus species). When collecting this species, you have to be sure to avoid collecting Canada wild rye instead. The two are fairly similar, but Canada wild rye has much longer awns. Once you see the two species side by side, you will have no trouble in telling them apart. As an aside, we use quite a few childrens' sleds to dry seeds. These make nice drying stations, and they are lots easier to handle than large trays. Since we are not planting large acreages, they are perfect for our purposes. All of the sleds we use have come out of the trash by the side of the road. It is amazing how many sleds are tossed out by residents. Although many of these sleds are cracked or broken, a lot are still fine, and they make great drying racks. The USDA now has all their soils maps on line and they are available for download in a format suitable for GIS. Since it is raining today, I have been spending some time preparing a version that can be used for vegetation analysis. 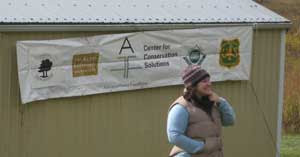 Here is a link to the NRCS web soils home page. When that page opens you click on the big green button that says Start WSS. This opens a US map plus a lot of options for zeroing in on your own property. I put in our address: 4609 Pleasant Valley Road, Black Earth, WI 53515, and a fairly high resolution photo of the Conservancy opened. (If you have the zip code you don't need the rest of the village and state data.) There are a lot of options for navigating, etc., but the main thing is to select an Area of Interest (AOI). You outline your area in a red rectangle or polygon, let up the mouse, and within a few seconds a cross-hatched overlay of the air photo is displayed. There are several tabs at the top, one of which says "Soil Map". Click on this and you get a soil map overlay of the air photo, with symbols for the various soil types. Also given to the left is a table which explains what each of the symbols means. For each soil type there is a link which will open up a detailed table describing that soil type. In addition, data are given on the percentage of each soil type in your AOI. 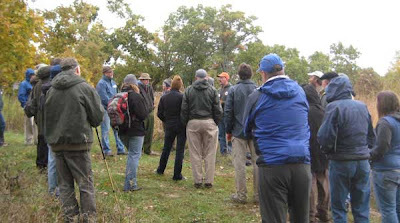 In essence, almost all the information that is available in the fat book entitled "Soil Survey of Dane County" is given on this web site. It is reasonably user friendly and works like a charm. There are also options for printing either the tabular data or the map. For GIS you can download the soils data, including the soil contour map (called "spatial data"). When you click on "Download Soils Data" you get a pop-up window that gives you choices, among which is the very important georeferencing coordinates for your area. There is a box where you fill in your email address. Then click "Download data". The program will then create the files that you requested and will notify you by email when they are ready. When I did this I got a message saying that there were four people ahead of me in the queue. Within less than ten minutes I had an email message which provided a link to the location of the zip file on the web server. The file contained a number of subfiles, including various shape files, readme files, tabular data, and some explanatory material. After a few false starts, I was able to bring the soil map into ArcGIS and overlay it on my 2008 air photo. Mainly I was interested in the contours of the various soils. 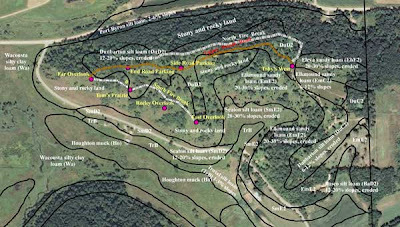 Then, using ArcGIS software, I labeled the soils, and added some of my own waypoints and tracks. The map shown below is a version that is greatly reduced in resolution (72 dpi) so that it can be uploaded quickly. The version I created is 300 dpi and can be printed at high resolution on a good color printer. I'd be happy to send by email the 300 dpi version to anyone who wants it. Now that I have this soil map in ArcGIS, I can start doing some vegetation analysis. 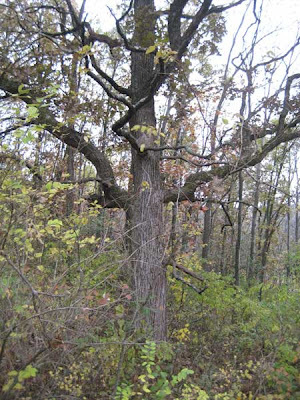 One of the glories of Pleasant Valley Conservancy is the large bur oak that is near our driveway. This tree is one of our landmarks, and has acted as a sentinel in our restoration work. When we first began restoration, this tree was invisible behind a screen of elms and buckthorns. 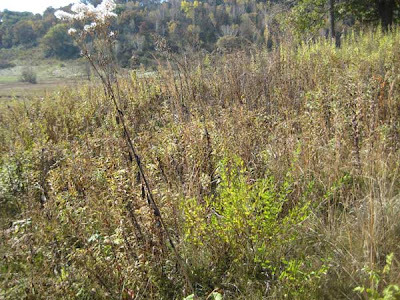 Once these had been cleared away, we had a veritable "buckthorn desert" for several years until the buckthorn toxin dissipated in the soil. The seeds we planted around it the first few years did not "take". Finally, about year three, we started seeing results. Two problems remained, which we finally were able to deal with this year: smooth brome and buckthorn. Smooth brome (Bromus inermis) is a nonnative clonal grass that is widely planted in southern Wisconsin farms and is a prolific seed producer. It is able to colonize any bare area and establish a green mat that keeps out native grasses. By the third year after clearing, it had become well established in this area, and persisted despite annual burns. If a prairie greens up quickly after a spring burn, you can be almost certain that it is due to smooth brome. Once we realized this, we started getting serious about smooth brome control. The "trick" to eliminate smooth brome is an early spring glyphosate treatment, before any native plants have appeared. Remember: if the plant is not above ground when you spray with glyphosate, it won't be affected because the herbicide is inactivated by soil particles. We had already used this method to eliminate smooth brome on the Pleasant Valley Road cut, and in the Barn, Valley, Ridge, and Crane Prairies. Timing is critical, so spraying should be done when the grass leaves are about 4 inches tall. At the big burn oak, smooth brome was only a problem south of the tree, an area of full sun. Because the smooth brome area around the big bur oak was fairly small, Kathie and I used backpack sprayers. It took us about an hour to spray the area. Since the area had been seeded with prairie plants some years ago, we did not have to wait long to see results. By the end of July Indian grass was flourishing throughout, interspersed with many good prairie plants, including cream gentian, compass plant, rosin weed, cone flowers, etc. In the photo here, taken from the uphill side of the oak, you can see below the tree a red-brown carpet of Indian grass. Very nice. With so many good plants present, it is important to use great care when spraying an herbicide such as Garlon. See my earlier blog post for details.